I don’t know if anyone has seen this. Usually we look at science fiction and say “The prophet has spoken!” But now we have fantasy writers and mythologies coming to truth. Let us first gaze upon the great Tolkien. This woman found the One Ring. Sure it doesn’t quite look the same, but something gets lost in the translation when it’s been over two thousand years since the Ring was last seen. Peter Jackson got the details wrong. Tolkien wasn’t here to warn us directly. But he tried. 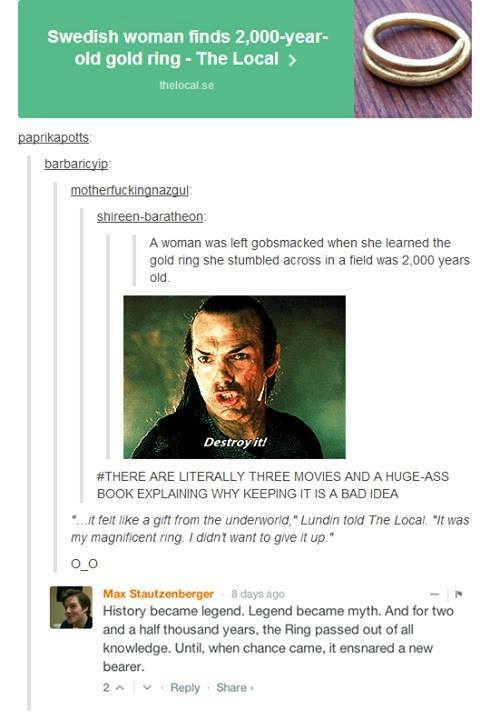 So did Frodo actually throw it in the volcano all those years ago? Is history about to repeat itself? She already finds herself pulled to it. Already, it’s difficult to give up this treasure. Surely, we shall find her in a cave, screaming “Precious,” and eating raw fish and anyone who happens by on accident. We now have a very tragic tale. The other bit of news is Ragnarok started February 22nd. There were no large wars. The skies didn’t light up in disarray. Surt has yet to come down and light the world ablaze, aside from two humans, man and woman, and a fist full of gods who no one cares about. However, I refuse to think they were entirely wrong. If you’re a Vikings fan, or even someone who watches the NFL, basically Valhalla was blown up. Think on that. The day after Ragnarok begins, we destroy the home of vikings. Now when the Mayan calendar came around to its end, it felt like the end of the world. But a man should only put down so much alcohol, cake, and Skittles in a night. What have you seen that mimics the fantasy realm? What are some of the cool coincidences in the world that you just look at, dumbfounded, and think “You can’t make this up”? That’s awesome. I’m keeping my eye out for stuff like more often. Like, ALL the time. Our world is a strange and amazing world. Now that we’re so connected, it’s so much easier to see these weird events. Good writing fodder. Especially for someone writing about immortals 😉 Try the Fortean Times for some ideas. Obviously some of these stories have to be due to immortal beings.